After three and a half months of running businesses, forty-eight NYC VEI firms participated in Local Business Plan Competitions between December 16 and 19 for the opportunity to advance to the Citywide Business Plan Competition. 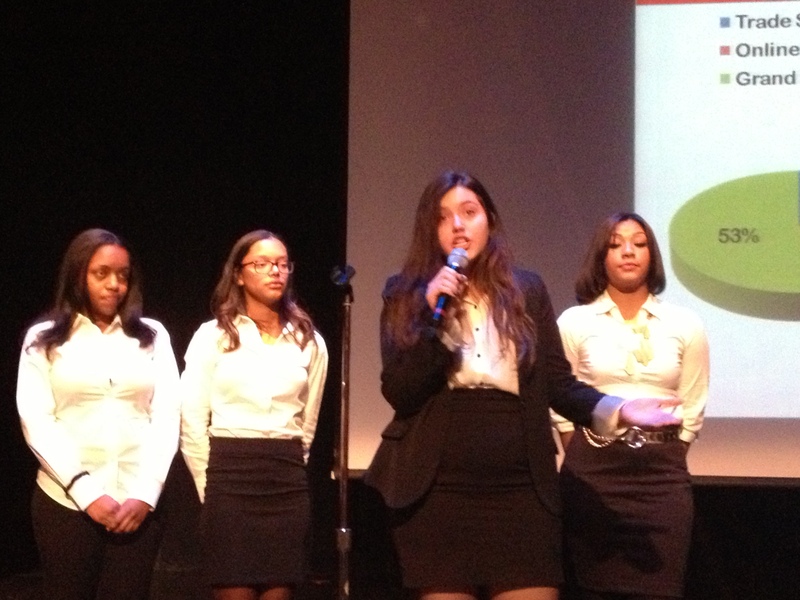 On December 18, eleven VEI firms presented their business plans to a panel of judges and an audience of students, parents, and supporters at Long Island University’s Kumble Theater. The Local Competitions offer all VEI firms in NYC a unique chance to publicly practice their own business plan presentations while also getting to learn from their peers across VEI’s U.S. Network. The presenting teams were allotted eight minutes to enthusiastically explain what their businesses do and plan on doing in the future. After each presentation, teams stayed on their toes to answer on-the-spot questions about their businesses and learning experiences from judges such as Professor Hugh Marriott from LIU. The presentations and Q&A session served as a good indicator of each firm’s position and progress through the VEI learning experience, highlighting the kinds of business activities and learning outcomes the students are expected to articulate in their written business plans. Student presentations reflected just how much real-world knowledge they’ve learned in only a few months. On a personal level, students found themselves better at time management, personal finance management, and leadership. On a professional and organizational level, these students learned how to create financial budgets, forecast sales and profitability, leverage the internet to reach customers on a global scale, offer diverse ranges of products and services, hold themselves accountable for completing tasks and projects, and effectively communicate with their coworkers, bosses, and employees. Under the glare of stage lights and the pressure of spectators, these students overcame the frightening challenges of public speaking to take their business plans off the paper, out of the classroom, and, hopefully, on to the Citywide Competition. The Citywide Competition takes place on January 17th at the United Federation of Teachers and the offices of Deloitte & Touche LLP.